Last week I mentioned the real first bike I bought as an adult in a story we published a story about some award winning Wisconsin Bike Shops. I bought that Trek 820 at Wheel & Sprocket and Amelia Kegel and a few other people told me she never knew that. The story is longer and has a lot more meaning to me, so I thought I would share it one more time. 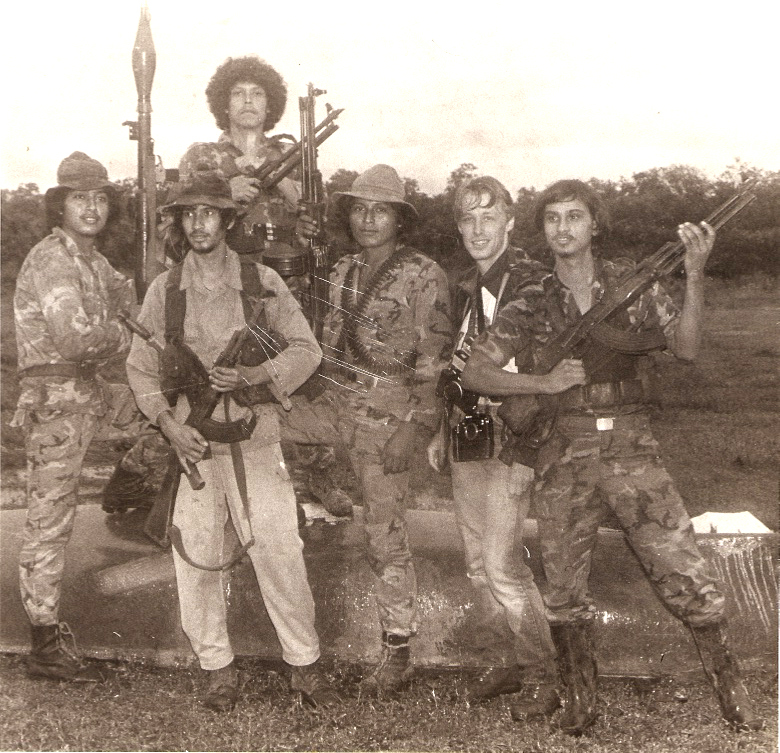 Me and the boys on a patrol up the Rio Escondido in Nicaragua. I did not bother retouching the scratches on this old photo. In my former life, I was a professional photographer long before I ever took a photograph of a bicycle. I did primarily editorial and news work. My clients included wire services like United Press International and the Associated Press. I did regional work for national news magazines like Time and Newsweek (I was a “C” shooter, never in the “A” class doing glam cover shoots). I also shot for newspapers, both local and national. I shot for a ton of trade and business magazines (guys in ties stuff). I did some fun stuff for the likes of Milwaukee Magazine, Art Muscle and some other funky mags. But what I enjoyed shooting most were personal documentary projects. These were all self funded trips to places like Nicaragua to work for a Sandinista newspaper, to the garbage dump in Guatemala City, photographing Wisconsin Native American Elders, etc. Most of my photographic heroes at the time shot Tri-X for Magnum Photo. Me back when people used film, light tables and lupes. Photo courtesy of my old Minnesota Daily pal Geoff Hansen. Click on the photo to see his work (with chickens). The business of photography changed dramatically from the time I started shooting professionally in the mid-eighties to when I quit shooting (twice). It became harder and harder to make a living shooting news and almost every freelance photojournalist I knew had to supplement editorial stuff with advertising. I was never into the “art” of photography, more the power of photography to improve social equity, so the advertising stuff was just not my thing. I tried to fake like I enjoyed it, but I knew I was transparent when a model I was shooting for a Jim Beam project told me it did not look like I was having any fun. If you don’t enjoy getting paid $1,200 a day to photograph beautiful women for a whiskey company, you shouldn’t be shooting advertising, because that is about as good a gig as you can find. That started me thinking that I needed to find another way to make a living, but at the time I had not idea I would end up a bicycle advocate. Where we going drinking after the game boys? 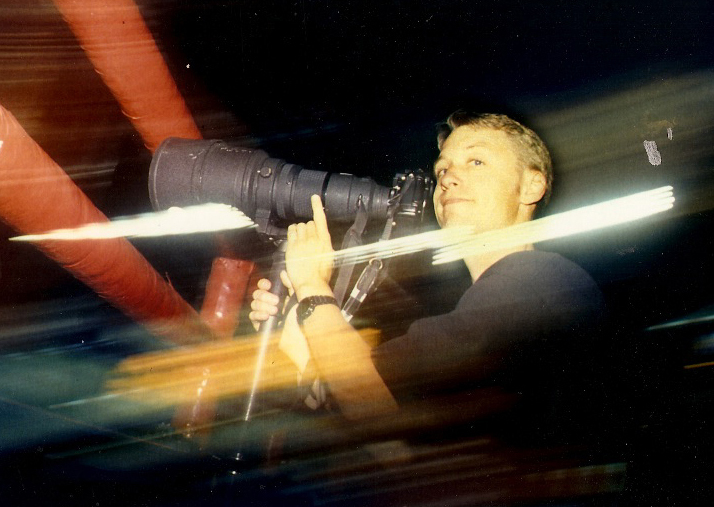 I shot professionally for about 15 years in total and during that time I would work odd hours, traveled a lot, lived by a pager (remember those?) and often ended up going out with other photogs at night to shoot pool (often at the Belmont Hotel or Tony’s on S. 2nd St.) after covering a Bucks or Brewers game. I was not an alcoholic, but I was smoking two to three packs of Vantage cigarettes a day and drinking a few beers and driving home to my studio multiple nights a week. I remember one night when a friend came home with me and he scraped a car with his car trying to turn into my alley. Turned out he was an alcoholic, but that incident got me thinking about driving after drinking. Even though I might not even be legally drunk, I figured the odds of me eventually hurting somebody driving home after a few beers were too high to ignore. Since most of my commutes to (then) Miller Park or the Bradley Center were only a few miles, I decided to get a bike. So I went to Wheel and Sprocket to buy an inexpensive 1992 Trek 820 mountain bike with a rack and lights on it so I could go out after shooting a game and bike home to my studio without killing anyone. Most of this riding was at night, and I found out that I really enjoyed my private vampiric bicycle life. It wasn’t long before instead of taking the shortest route from the stadium to the bar to my studio, I made a point to take odd routes, poking around the dark corners of Milwaukee and exploring places I had never seen in a car. When friends found out I had a mountain bike they asked me to go with them to the “single track” at the John Muir and Emma Carlin trails in the Southern Kettle Moraine. I had little idea what single track was and I would usually respond: ”Uh, you don’t understand, I have not put on a pair of shorts of any kind in about 15 years. That is not what this is about.” Anyway, I kept rolling around from bar to bar and home again at night, cig hanging from my lower lip, camera bag on my rack. When the alternator on my ’63 Herald went out, I remember bungeeing it to my rear rack and pedaling over to Double E Automotive to have it rebuilt. The guy at the counter thought I was crazy to be lugging a heavy alternator like that on my bike. The current management at Double E would not have that same response, as they now sell vintage bikes there! Despite my efforts to keep this about getting safely from point a to b with an elevated blood alcohol level, friends kept bugging me to go to the mountain bike trails at the Southern Kettle Moraine. Maybe just to prove to them it was a bad idea and get them to stop asking me, I donned a pair of cut-off jeans, expecting the sight of my ghostly white legs alone to prove I had no business recreating in the woods. 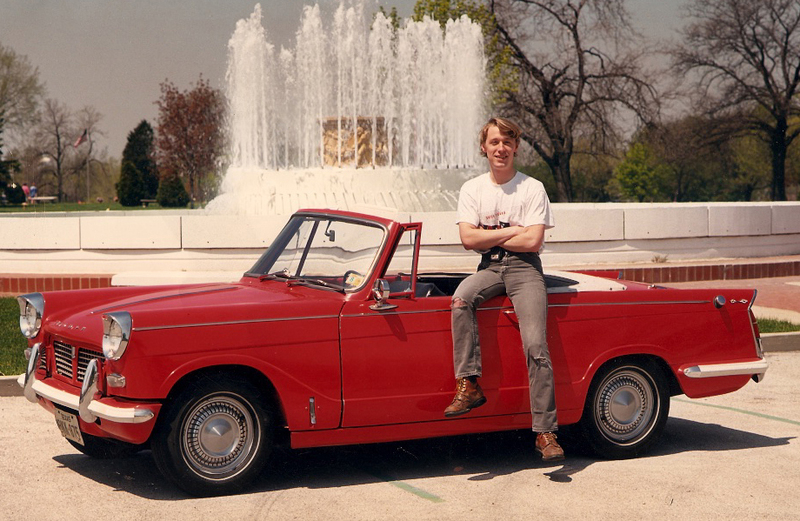 Me and my Triumph Herald photographed by a fountain in a cemetary. I did not see the connection back then. But it turned out that I really liked mountain biking. In fact, in my usual all-or-nothing manner, I started doing it a lot. Before I knew it, I was lugging my big Motorola brick cell phone in my back jersey pocket (freelancers can’t miss a call) and riding in mtb trails in the Kettles 3-5 days a week. Eventually I realized I could not keep up my cigarette habit (as much as I loved those old “mod” Vantage soft packs) and ride like I wanted to. So over time I tapered off and eventually broke my cigarette addiction. I also stopped going out every night, so I could wake up early enough to hit the Kettles and still shoot a baseball or basketball game in the evening. Now, don’t get me wrong, I am no saint these days, but I haven’t bought a pack of smokes in more years than I can remember, and I only go out to a bar a once or twice a week instead of five. About the same time I began to make a conscious effort to reduce my driving for environmental reasons and because I simply began to dislike the amount of driving compared to commuting by bike. Remember, this is from a guy who collected cars (67 Austin Healey, 63 Herald, 62 Mercury Comet, 62 Mini Cooper, etc). I specifically remember being stuck in traffic on my way to Chicago one day to shoot some guy in a tie and thinking about a BMW ad that bragged about the charcoal air filtration system that left the air inside your beemer fresh and clean. I realized I was part of the problem not the solution, no matter how many meaningful documentaries I shot. I remember thinking I wanted to be the kind of person I wanted to take photographs of rather than the person taking photographs of people I admired. So I quit my career as a professional photographer, just like that (ask my wife). It is telling that although I was a professional photographer when I bought my 1992 Trek 820 Antelope (mine had a rear Blacburn rack and lights on it), I don’t have any photos of it, just pictures of my car! I only bought this bike so I could ride home after a few beers and not worry about hurting anyone. I embraced the bike lifestyle as fully as I could. I began racing. My resting heart rate was below 50. I bought a lugged Bridgestone XO-1. I worked briefly for Waterford Precision Cycles as a (almost) builder. Then I was hired to open the Milwaukee office of the Bicycle Federation of Wisconsin. I worked there for 5 years when I was hired by the City of Milwaukee as their first Bicycle and Pedestrian Coordinator. I worked there for six years when I was lured back to the Bike Fed, and here I am today, still rolling along. I’m not sure I can truly say that Trek 820 Antelope with the 90s white and black splatter paint saved my life, but there is a pretty good chance I would have lung cancer or at least emphysema right now if I had continued to smoke all those cigarettes. I eventually gave that bike to my brother, a rock-in-roller, punk rocker in Chicago with a similarly unhealthy nicotine-filled lifestyle. He is still rockin’ (albeit in an alt-country outfit called The Waco Brothers and lives in Austin now) and rollin’ to work, but on a different big brother hand-me-down bike now. That Trek was stolen when he lived in Chicago. Before he lost it, that bike may have helped save his live too, as he quit smoking and now even runs marathons! I have often wondered if that bike changed the life of the thief who stole it. That little Trek Antelope had some powerful good mojo. I don’t know where that Trek 820 is today, but I know I am a better person for having ridden it. 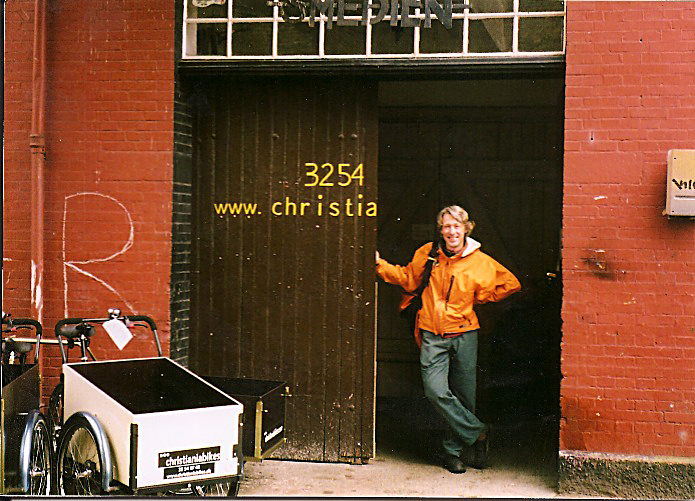 At 48 years of age, I walked a long and twisted road to on my pilgrimage to the Christiania factory in Copenhagen. I am 52 now and still pedaling, thanks to that Trek and my friends over at Wheel and Sprocket. Loam Boy. Those Vantage packs were mod. You’re still an inspiration. Great, story and an inspiration to many I’m sure. I was into Marlboro’s. It was an old half dead Schwinn Varsity left on my front lawn one night that never got claimed that got me biking a little. That bike seemed like a present from the gods to replace a new Varsity I got when I was 12 in 1962 but which had been stolen while I was in college. A new Raleigh got me riding enough to quit smoking and saved my life as the Trek saved yours. There have been many bikes since, but not one cigarette. I decided to get a bike. So I went to Wheel and Sprocket to buy an inexpensive 1992 Trek 820 mountain bike with a rack and lights on it so I could go out after shooting a game and bike home to my studio without killing anyone. Lets keep in mind here that a bicycle is still considered a vehicle, and motor vehicle law applies to bicycles. While I applaud this person for being some what responsible, and not driving a motor vehicle, however, Riding a bicycle while loaded up with alcohol isn’t acceptable either. Thank you Dave for sharing this story! Wow, what a great blog post. People seem to have really special relationships with their bikes. I rode bikes when I was a kid like many. When I went to college in Appleton, WI, my money ran out, I sold my VW bug, and purchased a brown Continental (early 1970′s). For two years I rode that bike crossing the College Avenue bridge in sunshine, rain, and light snow. This year I re-discovered biking a bit with my wife and own 4 bikes of my own in the garage (only one fits correctly). Anyway, the closest an overweight geezer will ever get to flying is finding a 1989 Schwinn World Tourist bike in great shape (that’s my Sunday bike). My bike hasn’t “saved my life” yet, but it’s “trying”. I’m easy to find on LinkedIn. If you send me an invitation, I’d be proud to link with you on LinkedIn. Best Wishes from Chicago, IL. Hi,That bike seemed like a present from the gods to replace a new Varsity I got when I was 12 in 1962 but which had been stolen while I was in college. A new Raleigh got me riding enough to quit smoking and saved my life as the Trek saved yours. This article was very inspirational. Thank you for sharing. Your bike indeed is your great companion. Thank you for inspiring me. If I will be the owner of that “TREK MOUNTAIN BIKE” I will keep it until my last breath because it gives my second life. Your love and care for bike is one of a kind! Inspired here. Keep on inspiring others.